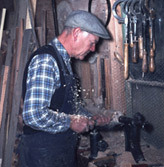 Already in 1907 the first workbenches were built in Målilla. The factory of that time was destroyed in a fire 1945, but it was rebuilt the following year. 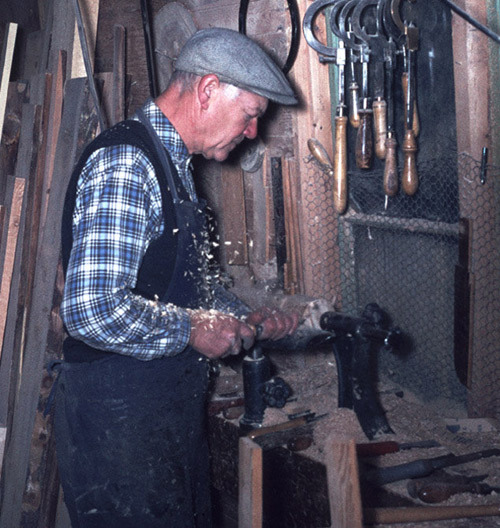 Since then the workbench production has continued in the same family and the workbenches still look the same as they did when the company was started. The standard workbench model (MA) has traditions from the 18th century and is called classic or gustavian. 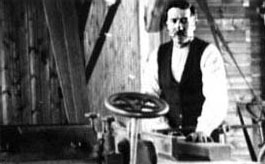 The photo above to the right shows the founder of Målilla Hyvelbänkar Carl-Johan Johansson by the plane machine. It was taken around 1912. 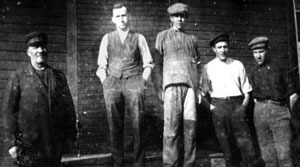 The photo on the left below shows the company work force from 1912. 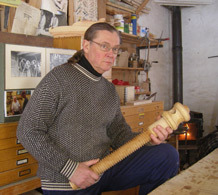 The photo on the right is of Yngve Karlsson. From the left: C-J Johansson, Edvin Johansson, Einar Balk, Willy Carlsson and Axel Carlsson. Today, we are the only company remaining in Sweden that still builds workbenches in the traditional craftmanship fashion. Our customers are mainly various woodworking schools and wood sculptors with high demands on their equipment. The factory in which the production takes place today looks the same as it did in the 1940s. The current owner Leif Karlsson (right) is currently running the company in his spare time.